This all-inclusive resort offers much-needed sun and sand. 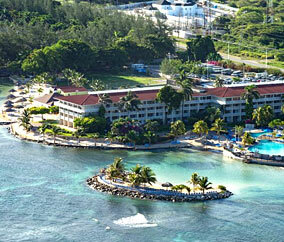 Soak up the rays on the half-mile beach, splash around in the pool, and indulge in the swim-up bar. The kids will have a blast at the Kidspree Vacation Club, while parents can unwind and try out the honey-ginger body scrub at Sol Mer Spa & Salon. Members receive up to 5% cash back on room rate after stay. Always striving to ensure you have a relaxing vacation that provides something fun for everyone, Holiday Inn Resort® offers unique activities guaranteed to keep you entertained. During the day, take an excursion, enjoy our game rooms, participate in recreational activities, sign up for children's activities, or simply relax by the pool. In the evening, enjoy nightly entertainment such as live music or karaoke. Whatever you want, their friendly staff is there to help. It's your vacation—they’ll make sure it’s a great one!